Dhondas: Dhonas is a baked preparation made made from grated cucumber, coconut, jaggery and sooji/rawa. Dhondas is a part of the Malvani cuisine, from the Konkan region of Maharashtra, Goa and parts of Karnataka. 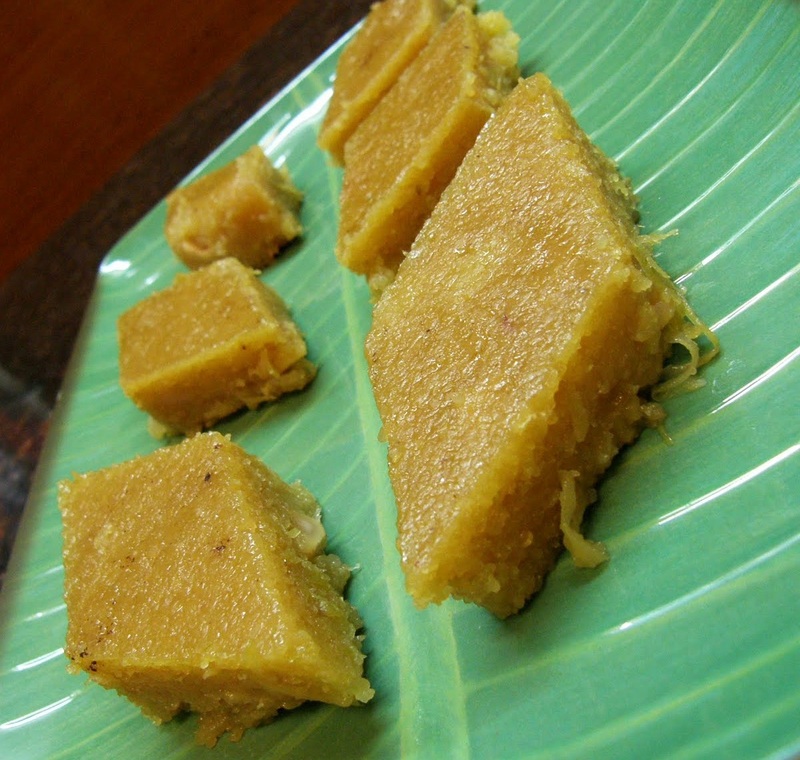 Dhondas is a traditional dessert, is mildly sweet and good for health as well. Retain the water that you get while grating the cucumber as it is also used for this dish. Mix the grated cucumber, cucumber water, grated jaggery, chopped cashew nuts, grated coconut and salt in a pan. Cook the mixture, stirring continuously, till the jaggery milts. Allow the cucumber mixture to cool down to the room temperature. In a separate pan, melt the ghee. Roast the semolina in the ghee till it is well roasted. A good indicator that the semolina is well roasted is the wonderful aroma that arises. Remove the semolina from heat. Allow the semolina to cool sown to the room temperature. Mix to the roasted semolina with nutmeg powder, baking soda and the cucumber mixture. The resulting batter should be of a cake batter consistency. Place the mixture in the baking tin and bake in a pre-heated oven at 180°C for 25-30 minutes. Test if dhondas is done, by putting a knife straight through the dhondas and pull it out. If no remains stick to the knife, it means that your dhondas is done. Dhondas is ready to be served. Cut the dhondas in desired shares and serve. Dissolve the baking soda in 1 tsp of milk, ensuring no lumps are formed, and then add it to the mix. Sometimes, depending on the variety of rava used, the batter becomes very thick and rather dry. If this happens, add a little milk to soften it. If you have any queries regarding the Dhondas recipe, please leave a comment.